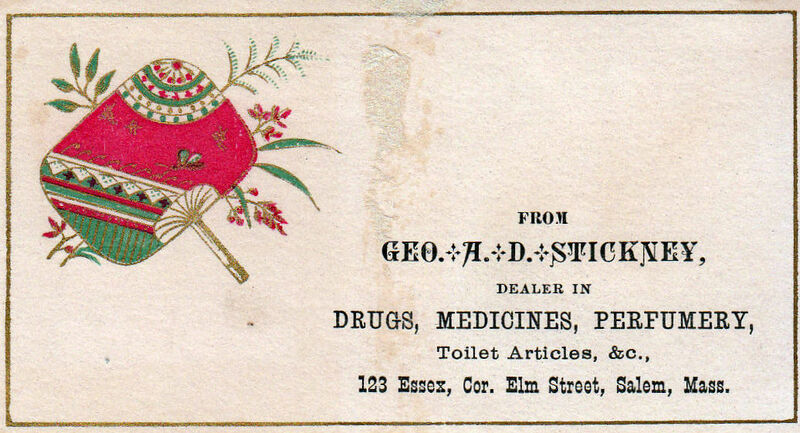 I’m not sure when I last posted on trade cards, but it was definitely a while ago. This blog is getting to the point where it needs an index, I fear. 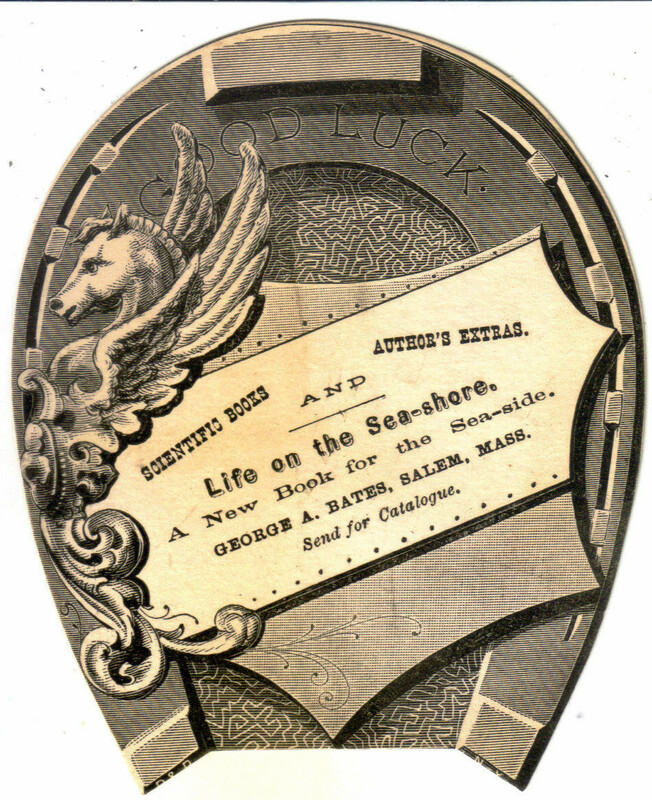 I’m always on a rather random hunt for interesting examples of advertising ephemera: I like Salem-related items, but they have to be special in some way. There are just too many stock items out there–plump children, scary clowns, kittens, flowers. 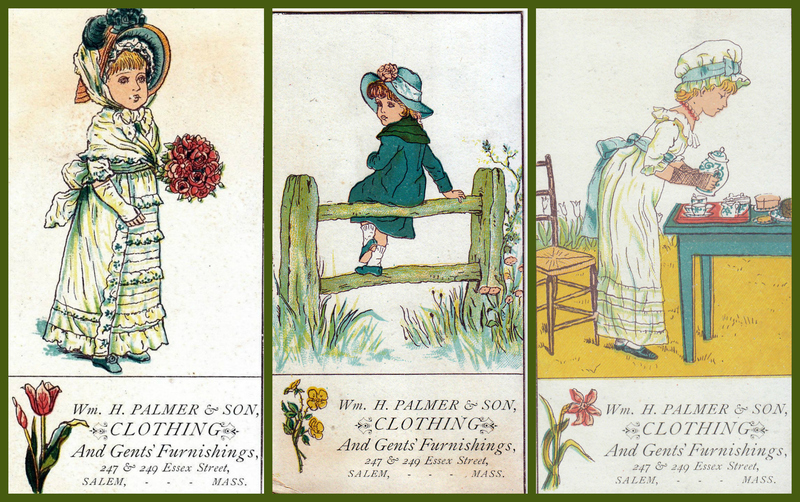 So many cards were produced in the last quarter of the nineteenth century (before they gave way to magazine illustrations) that millions survive, preserved as tokens of trade and little windows into the contemporary commercial landscape. 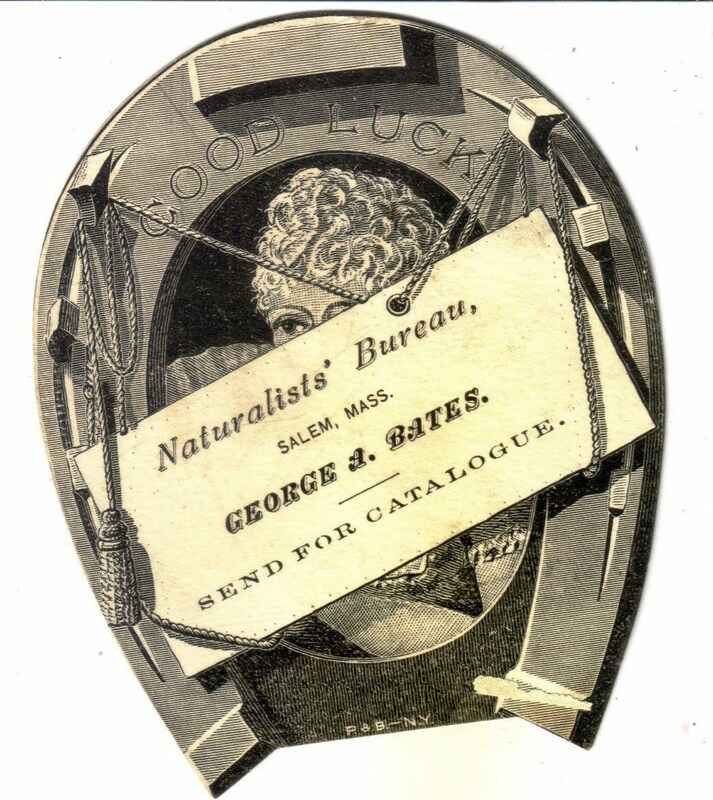 Harder to find are cards with interesting shapes, and metamorphic cards, examples of Victorian special effects achieved by holding the card in question to the light, or folding it a certain way. The latter are getting pricey; one (a very rare example of cross-dressers) recently sold on ebay for $150. Here are a few of my recent purchases, and cards which caught my eye: corsets and Frank Cousins, one of my favorite Salem entrepreneurs, are an impossible combination for me to resist, as are horseshoes, Kate Greenaway-esque little girls (an exception to my no children rule) and anything apothecary-related. 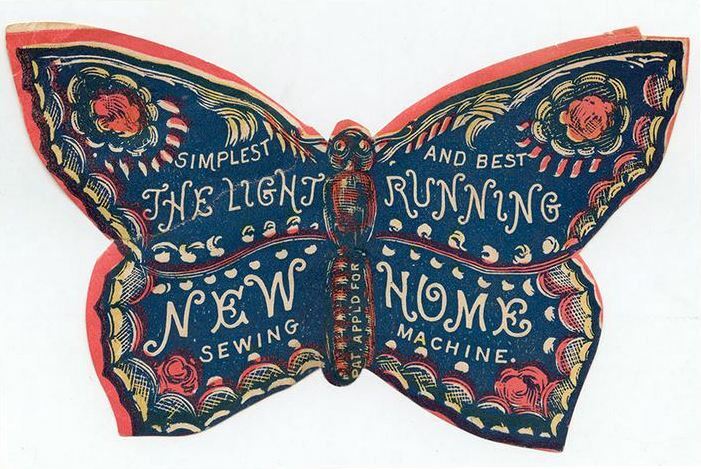 The amazing die-cut trade cards of a butterfly and what looks like a cracker or biscuit to me but is supposed to be a cake of soap manufactured by Enoch Morgan & Sons, are from Harvard Business School’s Baker Library (which is currently featuring an exhibition entitled The Art of American Advertising, 1865-1910) and the metamorphic card of Uncle Sam drinking coffee is from the Miami University Library’s Victorian Trade Card Collection. This entry was posted on Friday, January 31st, 2014 at 8:39 am	and tagged with advertising, Art, Collectibles, ephemera, Exhibitions and posted in History, Paper, Salem. You can follow any responses to this entry through the RSS 2.0 feed. 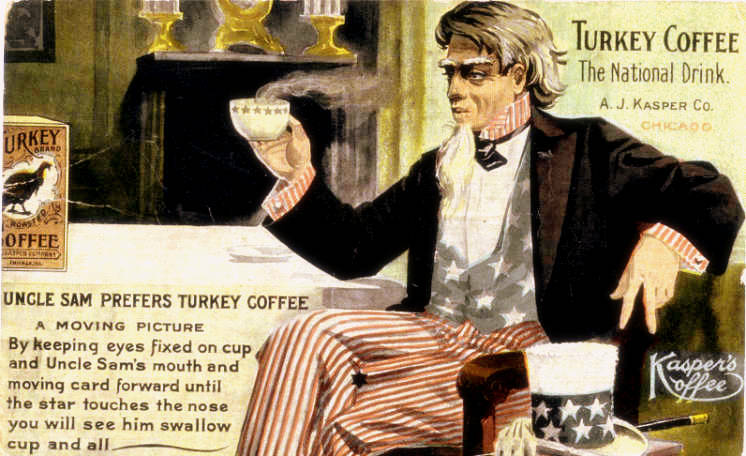 Is “Turkey Coffee” just a brand name, or does it reflect some other or substitute ingredient? I would hope not turkey! There are several illustrations of cans of this on the web, and they are labelled “Turkey Brand Coffee,” so my fears of a wretched flavor look to be baseless, and your suggestion highly likely. Mr Franklin was clearly NOT an expert in branding if he thought a turkey would make a good logo for his country:) But then American presidents rarely are. Take Mr Kennedy’s statement: “I’m a Berliner!” Now why would he tell millions of Germans that he’s a doughnut (which is what every Northern German present during that speech thought he meant)? Berlin = doughnut in Northern Germany. 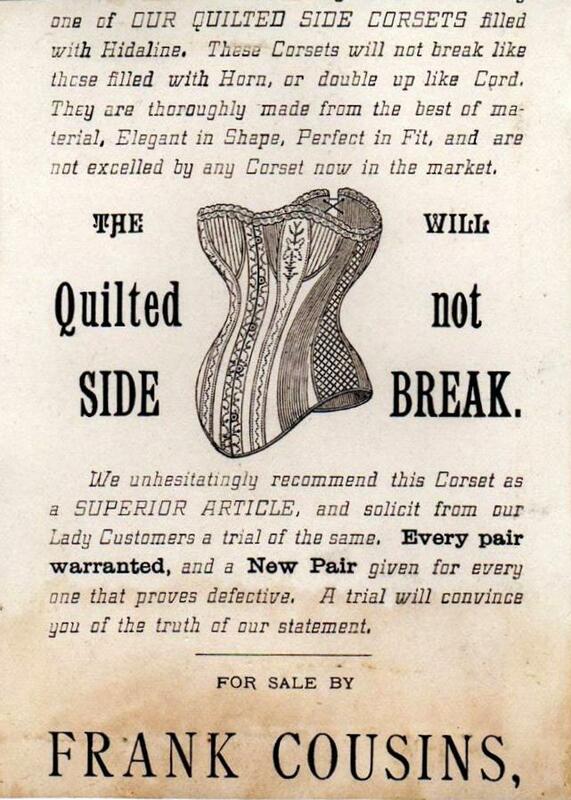 My mind boggles at what Victorian ladies got up to if their corsets risked frequent bursting or breaking. 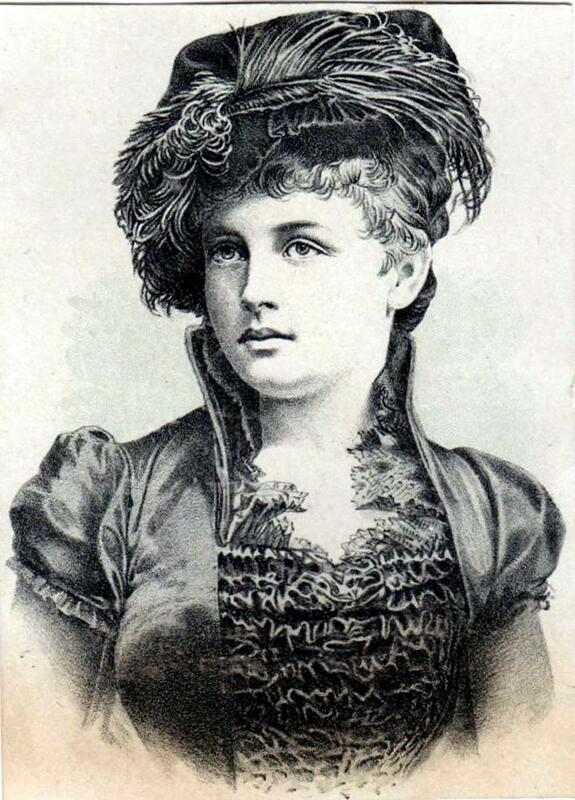 Were Victorian men far more hen-pecked than previously suspected? Did Victorian ladies batter their men with stout umbrellas or run cartwheels round them?